Don’t Die, Mr. Robot – Bullet hell fruit ’em up for PS4 and PSVita (Cross-Buy). Deep in the electro-abyss lives a little robot who loves to eat exploding fruit. He also quite likes staying alive. That’s where you come in… The hook to the game is the scoring system – each exploding fruit sets off adjacent fruits creating crazy-satisfying chains. As well as looking and sounding awesome, each explosion adds a multiplier to points scored with the chain. 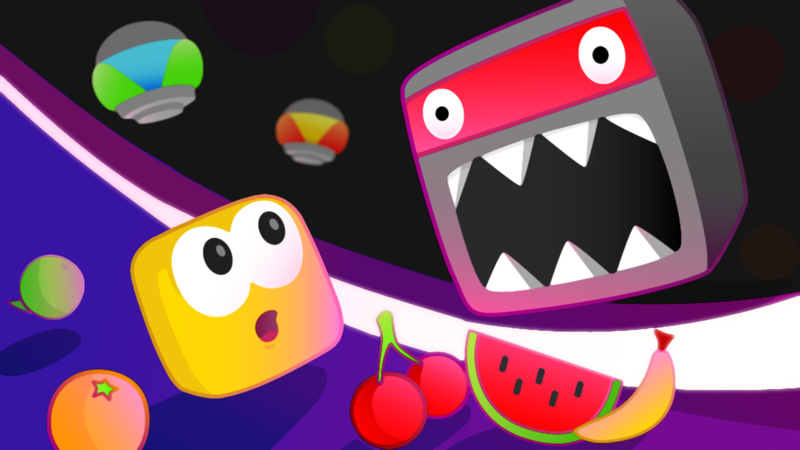 You’ll reach nail-biting levels of tension waiting until your fruit amasses on screen before you set one off triggering a massive chain explosion for maximum scoring! Don't Die Mr. Robot (DDMR) was made originally for PlayStation Vita. It soon became a cult favourite among Vita fans for its arcade action and addictive properties. The PS4 version came out just over a year later in March 2016. It features full HD graphics, 60hz gameplay and some really awesome stuff going on with the light bar. Don't Die, Mr. Robot has loads of game modes for lots of lovely replayability! We've got Remix Mode: Battle through 50 unique missions in Remix Mode which mess up the rules and push you to the limits of your reactions and skill. Arcade Mode: A never ending, different every time arena based fun machine! Hit the global leaderboards and try and become the world’s best dodger. Time Attack: 2m30 at tweaked difficulty to hone your skills. Dying costs time and points, so don’t die! Chill Out Mode: A more sedate and strategic but equally intense mode for when your nerves are just too fried to take on the game at full pace. Don't Die, Mr. Robot is easy to control: all you have to do is move your little robot! No complicated buttons here, no-siree. No buttons, in fact. What’s a game without unlockable hats and stuff? NOTHING! Unlock loads of different hats and robots to play with to make your own Mr. or Mrs. Robot look totally unique. There’s over 5000 different combinations to choose from! To promote Don't Die Mr Robot and grow its popularity (top games), use the embed code provided on your homepage, blog, forums and elsewhere you desire. Or try our widget.